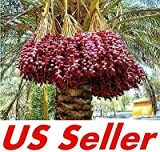 Date palm seeds for sale – Easy plant to grow edible but most, mostly grown for the ornamental plant structure, planting in spring to summer and autumn in warmer climate, possible to start from seeds but it’s impossible to ensure the quality of the fruits and if it will be male or female tree, so better to buy female plant (in order to get fruit). Growing information: perennial plant, growing hardiness zone: 8-11, water needed – average to big amount, light conditions – full sun, height: 7-20 m 20-65 feet. Blooming in the summer in star shaped flowers that appear in cream-yellow color. Edible part: fruits amd seeds, fruit harvest in the autumn edible raw or cooked and can be used as dried, sugary, leather fruits, cakes, cookies and more.